I miss the things I used to eat when I was growing up. There are so many new things to try now and so the tried and true recipes get shoved to the back of the line. 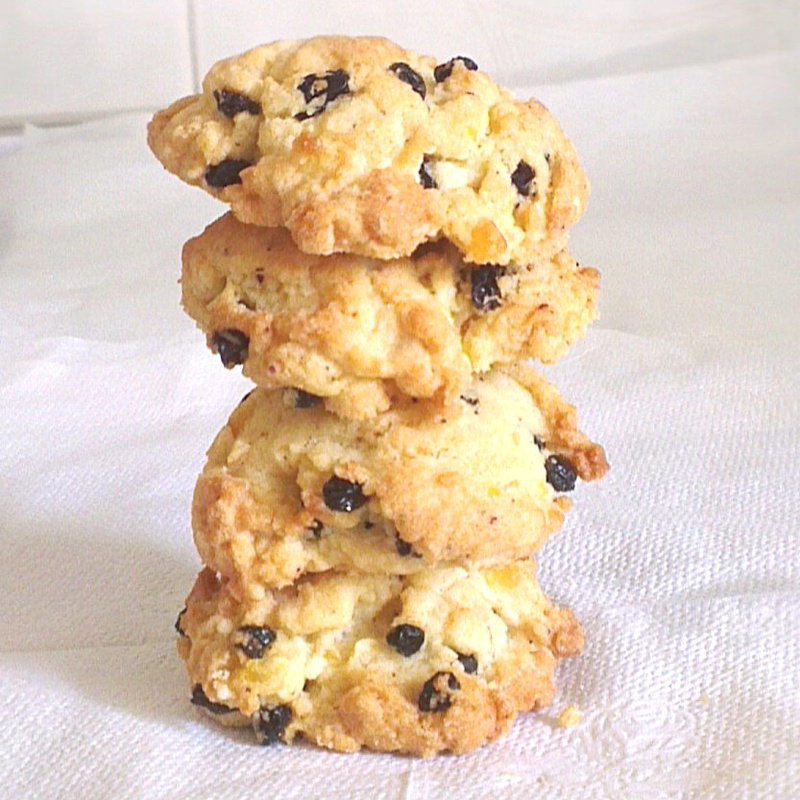 Today I decided to go retro and made rock cakes. I have a very sentimental attachment to this cake, as it was the first cake I learnt to cook. Back when my mother was introducing my sister and I to baking, we learnt that there were two main methods to cake making. The creaming method where you beat the butter and sugar together until the mixture turns a pale yellow colour or the rubbing in method where you rub butter into flour and then gradually add the other ingredients. 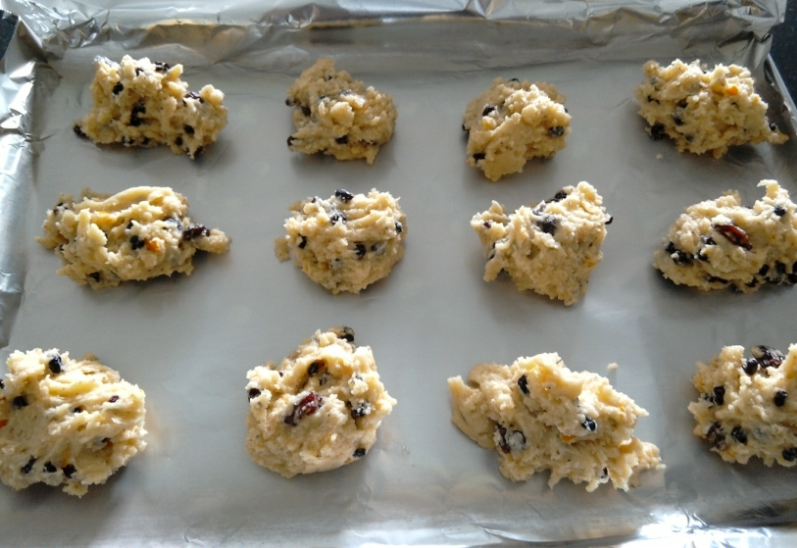 Rock cakes use the rubbing in method. It’s lightly spiced and chockful of currants and mixed peel. Even now, while I’m writing this, I can smell the wonderful aroma of cinnamon, nutmeg and mixed peel wafting off the cooling cakes. It brings back memories of childhood, messing around in the kitchen and eating these cakes in the garden. I truly believe that the sense of smell is tightly linked to the memory centres in the brain. I’m not sure why this is called a cake as it’s more of a biscuit. Even more puzzling is why they are called rock cakes. I suspect it’s because the cooking process is similar to concrete making. You add sand and cement (butter and flour rubbed together then mixed with sugar) stones (raisins and currants) and water (egg and milk) to make concrete bricks. 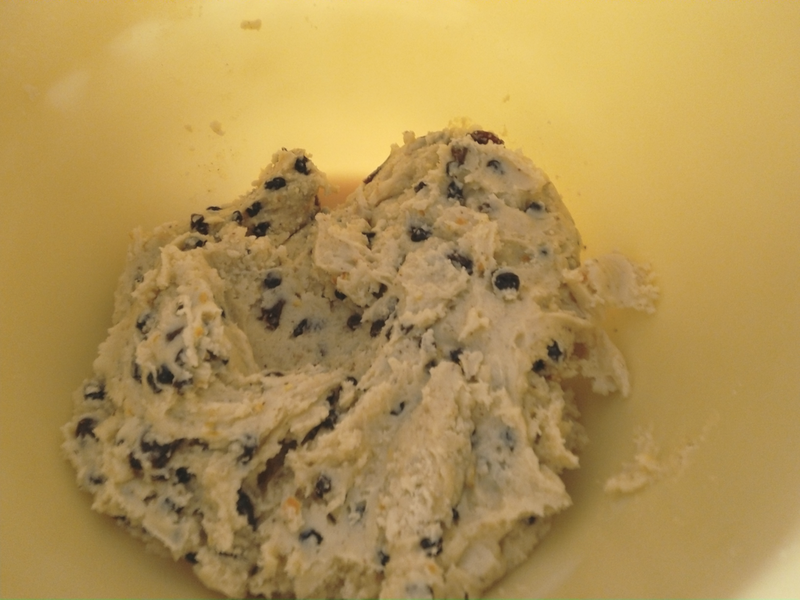 As you can see from the picture below, the dough does have the same consistency and texture as mortar. 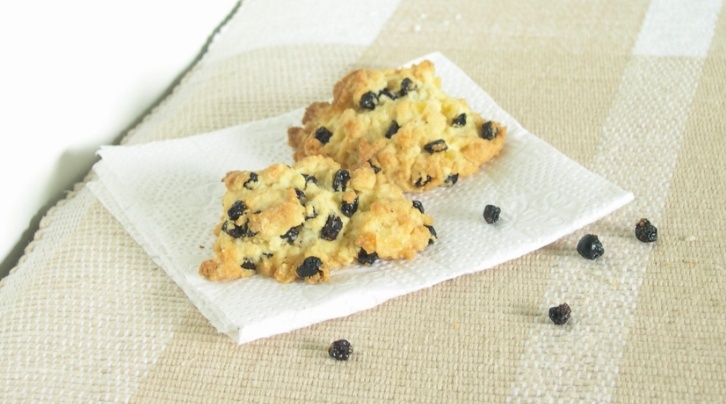 Or is it called rock cakes because the baked product does indeed look like little rocks. I remember one smart alec, telling me they are called rock cakes because you break your teeth on them. I didn’t think he was funny then, don’t think he is funny now. The cakes aren’t hard at all. They are cakey and crumbly and really delicious with a cup of tea. If you let them get brown, the cakes are more crisp, more cakey when they are a lighter gold. The recipe is from a venerable book of my mother’s. The pages are yellow and curling and the cover has fallen off. It has some good recipes though and I look forward to rediscovering them. Grease baking sheet and dredge it lightly with flour. Sieve the dry ingredients and rub in the fat. Stir in the sugar, currants, mixed peel and mix well. Make a well in the centre and stir in egg and enough milk to make a stiff mixture. With a teaspoon and a fork, place mixture in rocky heaps on the baking sheet and bake at 180 degrees Celsius for 20 minutes.